Nar Phu Valley is a least visited trek which diverts you from the popular and well-facilitated Annapurna Circuit for about a week. Himalayan Joy Adventure provides you a chance to explore this remote and undisturbed territory of Nepal. You leave the well-trodden trail of Annapurna Circuit at the midway for the rarely visited Nar and Phu Valley and join the Circuit again at Ngawal. For those, who want to explore the pristine and remote areas of Nepal, Nar Phu Valley trek must be in their bucket list. For about a week, you leave your modern amenities and trek to one of the most remote parts of Nepal. On the way, you rarely see trekkers. Porters and mules are seen often as they are the transporters of every good that people of those valleys need. The culture and tradition of this quarter of Nepal are truly mesmerizing. The traditions and culture of locals are influenced by Tibetan Buddhist. For about a week, you can explore several gompas, communicate with locals, experience the amazing environment and then rejoin the Annapurna Circuit. On the way, you have to pass Kang La Pass as well. The 5322 meters vertical altitude of Kang La Pass may be a bit enduring too. Your 23 days Annapurna Nar Phu Valley and Annapurna Circuit Trek with Himalayan Joy Adventure starts from Kathmandu. Remember that the trip is customizable as per your need. On the day 03, you drive to Besisahar and then begin your trek. After a couple of days of walk on the Annapurna Circuit, you leave for the remote and pristine region of Nar and Phu Valley. After about a week, you rejoin the Annapurna Circuit at Ngawal. From there, you continue your Annapurna Circuit trek by exploring other parts of Manang. Then, after crossing Thorong La Pass, you will enter into the restricted Mustang region and then fly to Pokhara. Next day you return back to Kathmandu. This entire trip takes 23 days from the arrival day to departure. Himalayan Joy Adventure will officially be welcoming and meet you at Airport & transport by private vehicle to comfort hotel. You will have leisure time, followed by an evening welcome dinner at a typical Nepalese Restaurant and discuss the trip, in Kathmandu overnight (1,300m/4265ft.). After morning breakfast, your begin sightseeing tour in Kathmandu valley. We will provide a private car and a professional city guide for the tour. 03 Days DRIVE TO BESHISAHAR THEN TREK TO BHULBHULE 840m./2756ft. The bus travel begins from New Bus Park of Balaju. You travel on a road that passes through beautiful countrysides for about 5-6 hours to reach Besisahar. Then, you trek to Bhulbhule where you will have your overnight stay. 04 Days TREK TO JAGAT 1300m/4265ft. Today, you trek to Jagat. You come across many small villages including Lampata, Ghermu, and Syange to finally rest your backpacks at Jagat. Today you will walk through the jungle and several villages. After you walk a few hours you will reach the place called tal which is the entry point of Manang district. After you finished lunch stop in Tal you will have such a beautiful walk on the bank of Marshyangdi river. You cross a couple of times Marshyangdi bridge you will reach a beautiful place Dharapani where you will spend a night there in the tent. 06 Days TREK TO KOTO 2600M./8530ft. In the clear morning, one can see the beautiful mountains from your hotel room. As you wake up, get fresh and have your breakfast, it’s time to move ahead. After walking for about two hours, you reach the Danaque village. Although sloppy, the path is easy. Danaque village has a check post and lodges with wifi and hot showers. A village of such size is rarely seen in this part of the trek. Then as you continue your trek, you have the option to pick a path - the dusty jeep road or a shorter but steep shorter trail. The shorter trail begins with an uphill step climb that rewards you with picturesque sceneries. At the end of the stone steps, you arrive in the beautiful village of Timang. Surrounded by snow-capped mountain, Timang sits perfectly in a valley. After Timang, you continue your walk through minor ascends and descends to finally rest at Koto. 07 Days TREK TO META 3560M./11670ft. Start the day a bit early as you have a lot of distance to cover. Today, you pass through beautiful woods, small caves, and resting places of pilgrims. In the beginning, the trail passes through a narrow canyon that gradually turns into an easy and wide trail. After crossing a waterfall, the trail passes through a thin forest and the view starts getting better. The last stretch of Koto-Meta trail has a steep uphill. This climb also rewards you with magnificent views of gigantic peaks. Then you finally end the day trek at Meta. The village sits at a big plain and has a few teahouses. 08 Days TREK TO KYANG 3820M./12533ft. This is relatively a short trek day which allows you to acclimatize. This route takes you through temporary settlements where people of the valley come to stay in the winter. The region is undisturbed from modernization. The people of this pristine region have preserved their culture and tradition. Situated at a high plateau, Kyang does not have any permanent lodge here. So, we spend the night in a tented camp in Kyang. 09 Days TREK TO PHU VILLAGE,4080M./13086ft. Today, you ascend further up into the Phu valley and continue marching towards Phu Village. The first part of the trek combines rock trail with high altitude, so you have to be pretty careful and walk with a slow pace. You then go down to the Phu river, you walk alongside the river for some time then climb uphill again. As you gain the altitude, you begin seeing prayer flags, chortens, and mani walls alongside the trail. That’s the indication of your arrival at the magical village of Phu with Tibetan culture. The Valley welcomes you at the Phu gate- the entrance of this medieval village. 10 Days EXPLORE TO PHU VILLAGE 4080M./13086ft. The day 10 is spent on exploration. You explore the magical village of Phu. Sitting on the beautiful and barren landscape, Phu village makes you realize that, the village is worth every single effort you put while trekking to this ancient village. The village has Tibetan influenced art and culture. You visit the monasteries, peek into the lifestyle of locals and engage yourselves in exploring this beautiful village. The Tashi Lakhang monastery and the breathtaking view of HImlung and its sibling peak are the major highlights of this place. 11 Days TREK TO NAR PHENDI 3490M./11440ft. On the day 11, you retrace back through the path that you entered the village. You move down to the small hamlet of Nar Phedi. The trail passes through Mahendra Pul and branches off at the Nar Phedi. You spend the day at Nar Phedi. 12 Days TREK TO NAR VILLAGE 4110M./13484ft. The trek is short but full of amazing views. You walk through a steep path cautiously. The trek rewards you with the breathtaking view of Kang Garu peak. You then follow the Mani walls, small monasteries, and a hut to arrive at the entrance gate of Nar Village. Nar village is bigger than Phu Village where you can witness barley cultivation. The village also provides you with amazing views of Pisang and Kang Garu peaks. 13 Days TREK TO KANGLA BASE CAMP 4530M./14862ft. After spending a night in the amazing village of Nar, you begin your trek to Kangla Phedi. The trek is a short one which will provide you with enough time to rest and acclimatize. You reach the second gate of Nar. You leave the Nar and march through yak pastures and ancient glacial moraines alongside the west ridge of Pisang Peak. You reach the Kang La Base Camp in the early afternoon which gives you enough time to explore the area and rest. As there are no lodges, you will spend the night in a camp. 14 Days TREK TO KANGLA PASS 5306M./17408ft. THEN NGAWAL 3660M./12008ft. Set off early; today, you have a long way to go. You begin the day by ascending Kang La Pass which is one of the major highlights of the trek. From Kang La Pass, the views of Annapurna II, Gangapurna, and Tilicho are just beyond description. The climb is steep with most parts straightforward. From Kangla Pass, it’s all the way down to Ngawal. You will have your overnight stay in Ngawal. 15 Days TREK TO MANANG 3540m./11614ft. 16 Days TREK TO YAK KHARKA 4018M./13182ft. Today, most parts of the trail is a gentle uphill climb. You leave the beautiful and lively town of Manang and cross a small stream and leave the Marshyangdi Valley. You cross through Tengi, the oldest village of Manang. The trail is full of yak pastures, juniper trees, and the amazing barren landscape that leads you to Jharsang Khola valley. You continue your trek to finally reach Yak Kharka. Overnight stay in Yak Kharka. 17 Days TREK TO THORONG PHENDI 4450M./14600ft. The day is spent by ascending and descending several times before reaching Thorong Phedi. At first, you ascend for a couple of hours before descending to a stream. After that, you again start climbing towards Thorong Phedi. Thorong Phedi is a small village which is also called Thorong Base Camp. Some trekkers opt to ascend higher to Thorong High Camp, some vertical 500 meters above Thorong Phedi. A demanding but one of the most beautiful days of your trek! You begin the day early climbing for about two hours to reach Thorong High Camp. Then, you continue your trek to reach Thorong La Pass which many trekkers see as a huge achievement. Located at 5,416 meters, this is the highest that many trekkers ever reach. You celebrate the achievement and capture some memories with your camera lens. The surrounding looks breathtaking from Thorong La Pass. After spending your time there, you begin your walk all the way down to Muktinath. After spending a night in Muktinath, it’s time to descend from Rani Pauwa to Kagbeni -.the gateway to Upper Mustang. It takes about two and a half hours to reach Kagbeni. You descend down to Jharkot which is a big Buddhist village lying on a rocky headland above the Kali Gandaki Valley. It has a red gompa and many interesting chortens. Then, you trek through a jeep road passing through Jhong Valley to arrive at Kagbeni. The trek is quite an easy one. 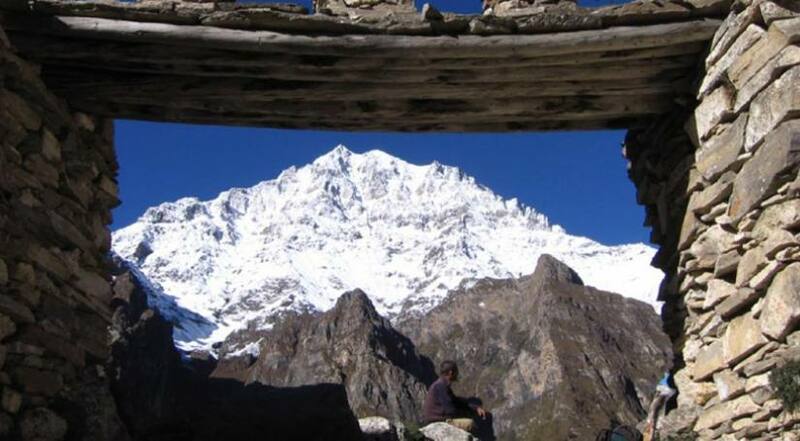 You walk through a wide Kali Gandaki Valley witnessing amazing surrounding and Nilgiri peak. You can take a rest at Ekle Bhatti for tea or lunch and then continue the walk. Near Ekle Bhatti, there a hundred meter long suspension bridge. If you have time, you can cross the bridge and walk to Dangarjong from where you see the amazing views of Kali Gandaki. You then continue your walk alongside Kali Gandaki river to arrive at Jomsom. You end up your trek at Jomsom. Enjoy your evening in Jomsom. Today, you take an early flight to Pokhara that takes about half an hour. After arriving at Pokhara, you can leave your bags in your hotel room and then explore this touristic town. There are so many attractions including Phewa Lake, Davis Falls, Begnas Lake, and many more. You can enjoy your time there and make sure you spend the evening at the lively Lakeside. Early in the morning, you leave for Kathmandu. After about 6-7 hours drive, you finally arrive at Kathmandu. Here, you can meet us and we will give you a farewell dinner. We are excited to hear your experience of spending about three weeks around the Annapurna region. Our trip has finally come to an end. Today is the day for your departure to your country. Or, if you want to continue visiting Nepal, there are so many options available as well. We will drive you to the airport terminal. We will wish you a safe journey and embrace your feedbacks.